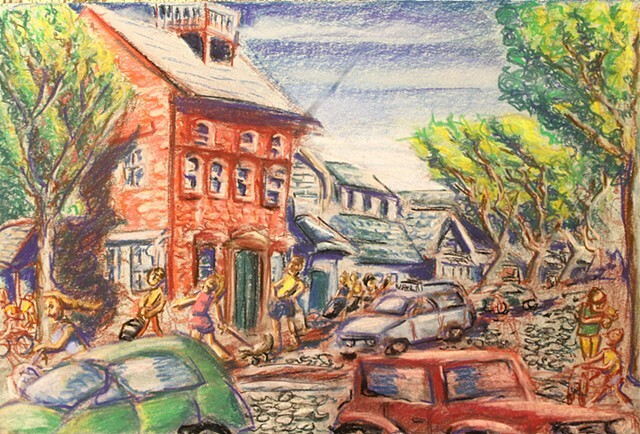 Nantucket Street Scene, Bottom of Main, by the Pacific Club. This summer, I decided to sit on main street between teaching classes and sketch the "summer scene" of people coming and going. I did a series of 4. They may become studies for future woodcuts or just remain as fun pastel sketches. This one captures the scene at the bottom of Main St. on the corner opposite the Pacific Club. Every one getting off the ferry, or on their way into town passes here. It's the quintessential scene.